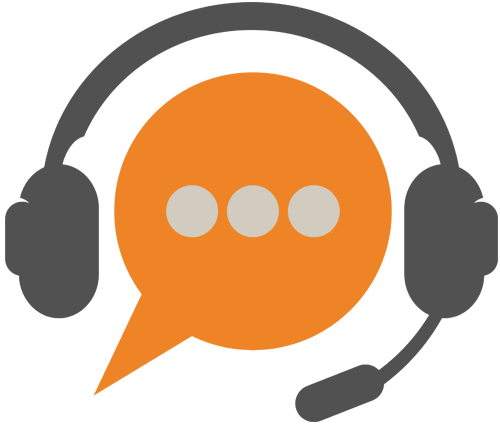 Real-time camera tracking, with keying and compositing software. Halide FX is Lightcraft Technology’s next generation VFX system. 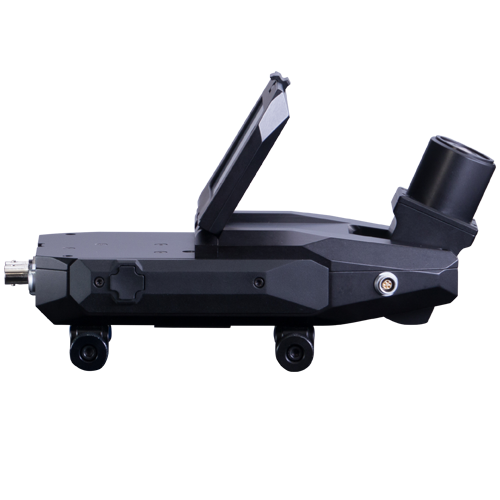 It is a real-time camera tracking, keying, rendering, and compositing platform. It has the same free-form, handheld-capable, wide-area tracking as its first-generation predecessor, Previzion, but with a radically simpler interface, integration with the Unreal render engine, and a cost that is less than half of Previzion. 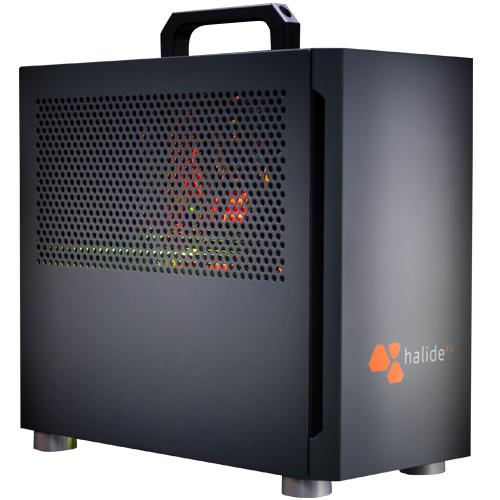 Most importantly, Halide FX is a self-contained, integrated system — we do the configuration so you don’t have to. The system is very compact. We no longer need a separate breakout box as used by Previzion; it’s just the Base Station and the Tracker (and the included lens encoders.) We supply a color balanced 24″ HP DreamColor monitor with the system, but you can use any 24″ 1920x1200 monitor on location if you need to. The new, Lightcraft-created Halide FX Tracker is an across-the-board improvement over the older Previzion Tracker. Halide FX’s Tracker has greater precision, accuracy, and stability than the Previzion Tracker. Its highly automated Target Mapping tool greatly reduces the time and effort needed to survey and record Tracking Target positions. The mapping & setup procedure requires no additional equipment beyond that which is built into Halide FX, and can be accomplished in about 10 to 15 minutes (depending upon the size of the surveyed space). Once the Targets are properly mapped, starting up the Tracker at the beginning of the day is a simple matter of plugging in the power cord. If tracking is temporarily lost (as when a camera operator tips the camera to a “rest” position that obscures the Tracker’s view of the Targets), it resumes as soon as the Targets become visible. A Tracker-mounted LCD screen and user-interface buttons facilitate fault-diagnosis and Tracker setup. The Tracker UI also allows for easy configuration changes (e.g., it allows users to switch between different target maps or to set the tracking camera exposure, etc). For user convenience, the Tracker’s performance can be monitored remotely. We now include our own lens encoders with every Halide system. An external follow focus can still be used by mounting it on the opposite rail from our lens encoders. 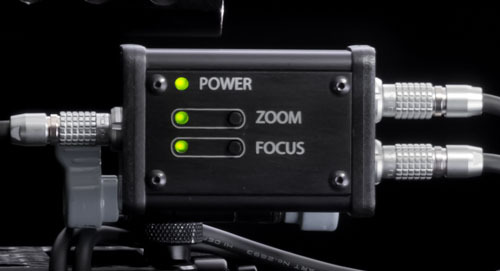 Using our lens encoders instead of trying to connect to dozens of different encoded lenses and follow focus systems makes it much simpler (and less expensive) for everyone! Currently Halide FX supports the Unreal Engine. Halide FX uses a stock build of Unreal, with our own custom plug-in to handle the data transfer between Unreal and Halide FX. The user has complete freedom to customize the Unreal side of things; we handle the keying, tracking, data synchronization, color correction, etc. The connection works really well, and makes operation extremely simple. Halide FX includes a simplified, easy-to-use real time keyer that can produce final quality keys on blue or green screen backgrounds. Setup and garbage mattes are far easier and more intuitive than before, making it possible for new users to come up to speed quickly. 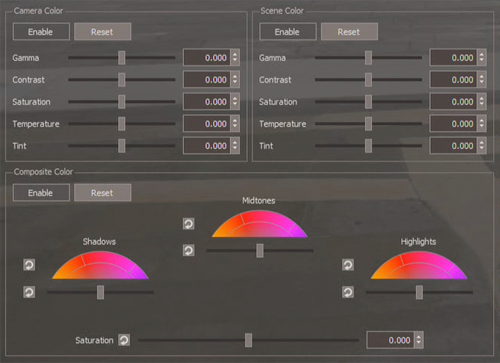 Halide FX includes a complete color correction system to enable precise matching of virtual and live action elements, as well as familiar color grading controls and a waveform monitor for the source and final images. Lightcraft systems have been the ‘behind the scenes’ real time pipeline for V, Once Upon a Time, Olympus and many other episodic television shows. 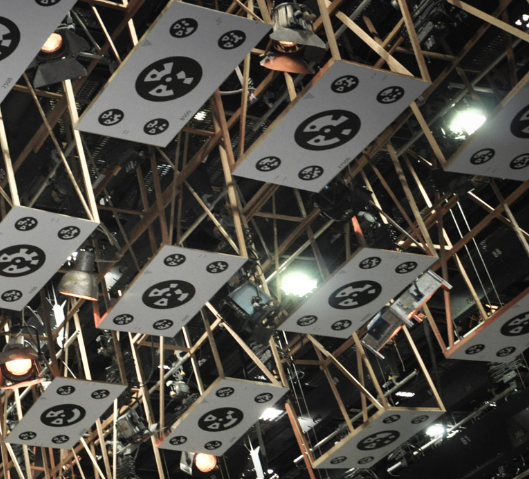 Lightcraft systems provide a real time on-set view of the virtual backgrounds, as well as drastically accelerating post production by saving the real-time camera tracking data for direct import into production tools. The camera lens must have mechanical stops for both zoom and focus rings. The camera must have genlock and timecode inputs. Halide FX automatically matches the sync of the tracking data with the camera video using timecode and genlock, so we need a timecode & genlock source that connects to both the camera and Halide. We have tested with and recommend both of the following units, but any production-spec timecode and tri-level sync generator will work. Lightcraft Technology has no affiliation with the manufacturers or vendors of the above components, and provides the above links merely as examples of suitable External Timecode / Sync Generators. 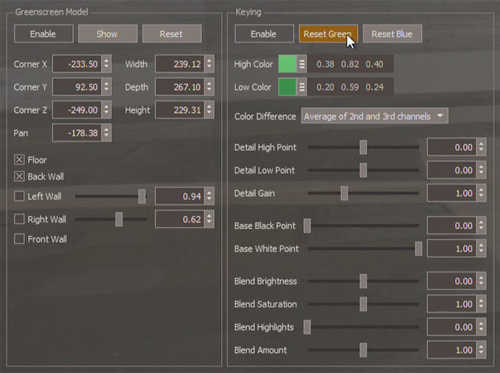 Halide FX is now using a user-friendly “Library” system, in which Lightcraft will provide pre-measured Lens Calibration Files for a defined set of supported lenses. These Lens Calibration Files will reside in an Open Lens Library that will be developed, maintained, and distributed by Lightcraft. 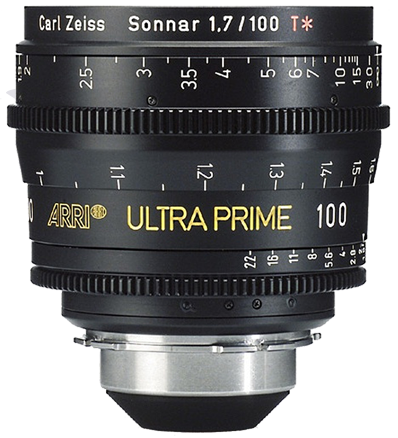 We are working on compiling a library of calibration files for the most popular fixed focal length and zoom lenses (prime and broadcast) from a variety of established manufacturers. 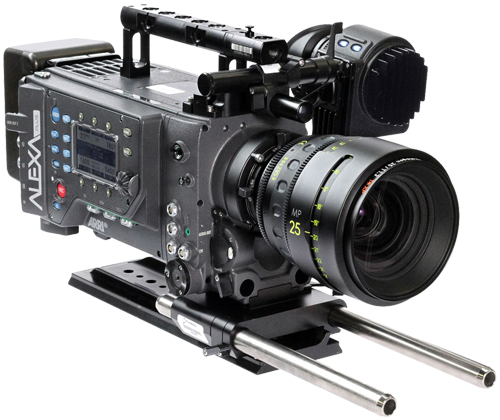 Please let us know what cameras and lenses you intend to use on your productions so that we can best assist you. Halide FX embeds the camera and lens tracking data into a user-selectable audio channel of the HDSDI output video signal. In this way, the tracking data is automatically recorded in sync with the composited image. 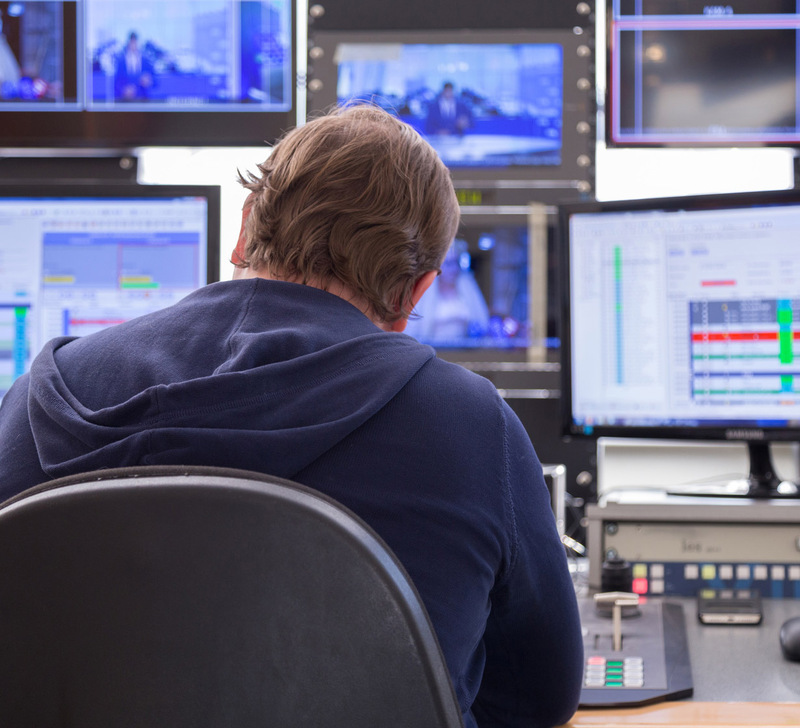 When editing, the user cuts the composited video to the desired sequence and exports the audio from that sequence to an uncompressed .WAV audio file. The tracking data can then be extracted via a scriptable command line tool (HalideExtractor) from that audio file and converted to a Maya ASCII file with complete camera tracking, zoom, and focus information. This data can then be used for final rendering, or imported into Syntheyes or other tracking tools to achieve sub pixel tracking refinement. Tracking targets are simple black and white markers that can be printed anywhere. Halide can recognize targets at anywhere between about 6x the target size up to about 30x the target size. We provide either pre-printed targets or PDF files for typical stage heights up to about 8 meters, and additional stage heights can be easily accommodated. We usually recommend printing on self-adhesive vinyl, and mounting onto a foam cored board called GatorBoard that is frequently used as a lighting bounce board. Non-interactive media is revenue-free with Unreal, according to their FAQ (under the “Are any revenue sources royalty-free” question). 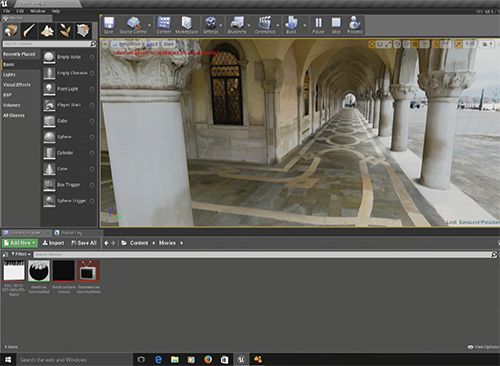 You can create your own environments in Unreal or import them into Unreal from any 3D content creation tool that can generate FBX files (Maya, 3ds max, Lightwave, Modo, etc.) Unreal can presently support up to (2) 1080 HD video background images in h.264 or WMV format. Unreal is rapidly improving on this feature, and it gets better with every release as Unreal supports more hardware video codecs. Unreal engineers have expressed a commitment to achieving 4K and ultimately 8K capability. 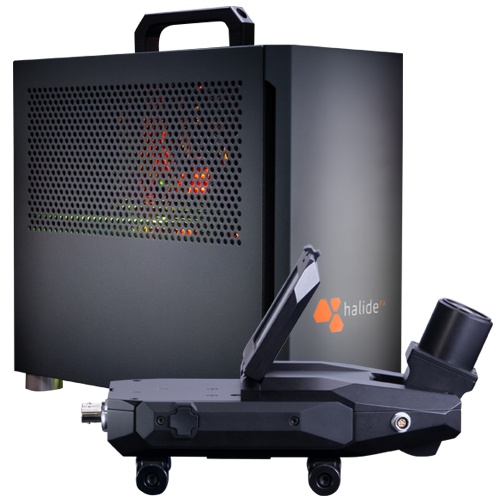 The Halide FX Base Station measures 17″ tall x 14″ wide x 7″ deep, which is considerably smaller than the usual 22″x14″x9″ limits on carry-on luggage. 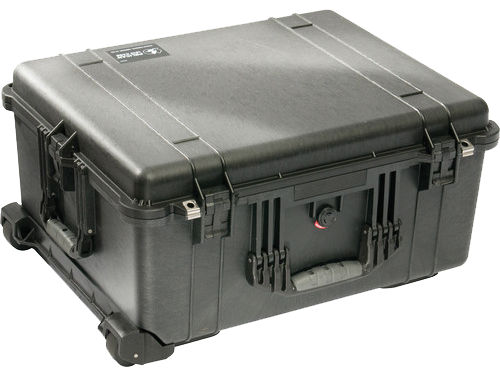 If it is to be checked in on an airline, we recommend using a standard Pelican case such as the 1610, with an inner size of 21.78″ long x 16.69″ wide x 10.62″ deep, so that there is at least an inch of foam on each side of the unit. The Tracker, at 10.5″ long x 5″ wide x 2.5″ height, can easily fit into a smaller Pelican case such as the 1400. The key (ahem) with blue or green screen compositing is to use the right paint, and light it evenly. We strongly recommend Composite Components’ Digital Green. Digital Blue can be used in cases where the live action element contains green, but it requires about twice the light intensity compared to Digital Green. 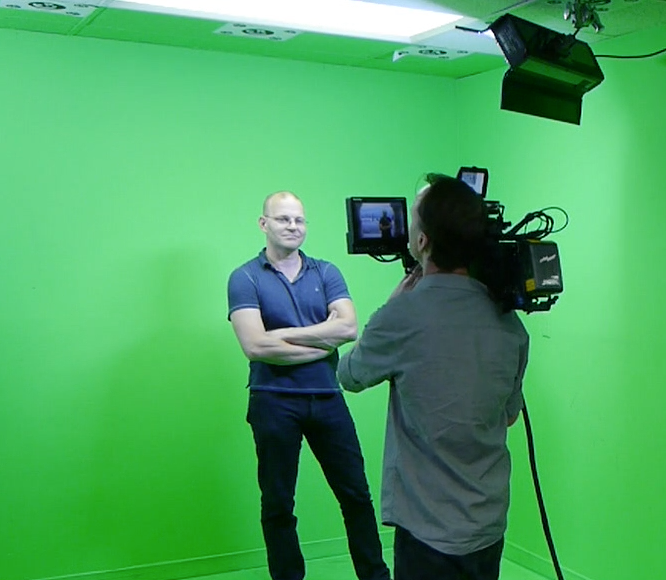 Chroma Key Blue or Green colors are not recommended. Halide FX support & updates will be free for the first year, and software updates + email support will be continue to be free for following years. We may have an optional phone support pricing after the first year, but the new system is so much easier to use that we don’t think people will need that. For quotes, custom configurations and special terms, please contact our sales team.